"It's kind of funny, because that picture is so raw. You would think that maybe like the league would have stylists, or hairdressers, or suggestions like 'Why don't we all wear the same blazer like we're on CBS or something, and look very stately?'" The NFL’s annual coaches photo always provokes a lot of jokes, for good reason. 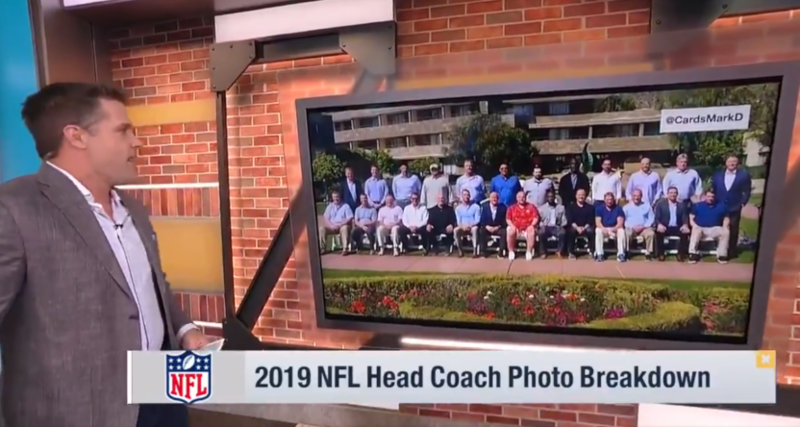 But it’s interesting to hear some of those jokes coming from inside the house, as it were, and NFL Network’s Good Morning Football did just that with a Kyle Brandt segment Tuesday morning. Brandt spoke with Awful Announcing Tuesday night about doing that segment, and about how he more generally approaches cracking jokes (see his segments comparing the NFL to Star Wars, the Oscars and Goldeneye) while on a league network. Here it is. How’d your coach look? Brandt said with this clip, he tried to find the right mix between finding things to poke fun at while not being overly mean, and that approach isn’t just because he’s on NFL Network. He said he hasn’t experienced any pushback from the network, but he does keep in mind where he works (and also, that his show’s supposed to be a light-hearted morning show) when he’s cracking jokes. Brandt said he always tries to keep in mind the balance between jokes and mockery. In this case, it helps that the owners don’t take that photo too seriously either. Brandt said the coaches themselves are aware there’s going to be some mockery there, too. Brandt said overall, he wants coaches to succeed. When it comes to the other pop culture segments he’s done, Brandt said he tries to keep that same balance of having fun without being too mean. Brandt said his background working as one of Jim Rome’s producers is part of why he’s doing lighter, more positive jokes now, especially considering his show’s morning timeslot. He said that also makes them a juxtaposition to a lot of what else is out there in the sports world.